Wild plants are a vital component in all terrestrial ecosystems. All living things on earth are totally or partially dependent on plants and plant products in one way or the other. 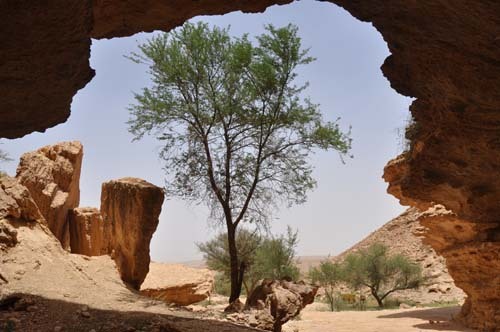 Kingdom of Saudi Arabia has a varied heritage of plant diversity, encompassing a wide spectrum of habitats ranging from mountains, sand seas, rocky deserts, meadows, salt pans, etc. and a variety of climatic regimes, ranging from Mediterranean, semiarid and arid climates. Vegetation of Saudi Arabia is divided into five broad categories. 1. 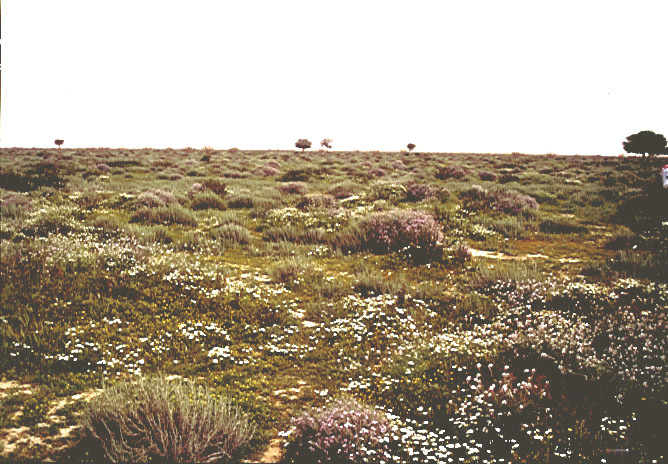 Vegetation of the coastal plains and Sabkhas 2. Deserts and scarcely vegetated areas 3. Dwarf shrub-lands 4. Woodlands and xeromorphic shrub-lands of high altitude areas and 5. Wadi Communities. Each of these is further divided into several subcategories (See the Vegetation Map and details of various plant associations). These vegetation units, most of which are similar to that of northeast and north African vegetation, are belonging to three Chorological Units, namely Saharo-Sindian regional zone, Somali-Masai regional centre of endemism and Afro-montane archipelago-like regional centre of endemism. Vegetation of the Central and Eastern regions is generally sparse. 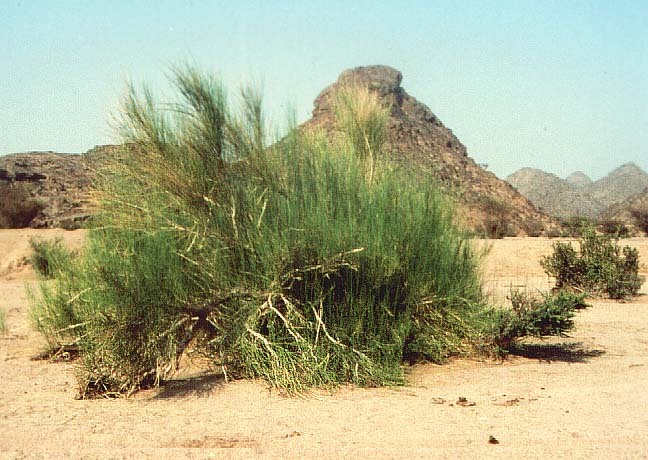 Annual plants, which constitute about 60% of the vegetation cover, are dominating in wadis and other shallow depressions such as Ammariyah, Huraimla, Wadi Hanifa, Raudhat Kafs, Raudhat Khuraim, Raudhat Noura, Raudhat Tanhat, Raudhat Asspilah, Thumamah, etc. Ephemerals start their life cycle during winter and shed seeds within 2-3-months. Perennial species, on the other hand, produce new shoots during rainy season and appear to be remain dormant during summer (Gymnocarpos decander, Sclerocephalus arabicus, Anvillea garcinii, Moltkiopsis ciliata, etc.). Some of the dominating perennial species are Acacia spp., Rhazya stricta, Pulicaria undulata, Rhanterium epapposum, Haloxylong salicornicum, Lycium shawii, Calotropis procera, Ziziphus nummularia, etc. 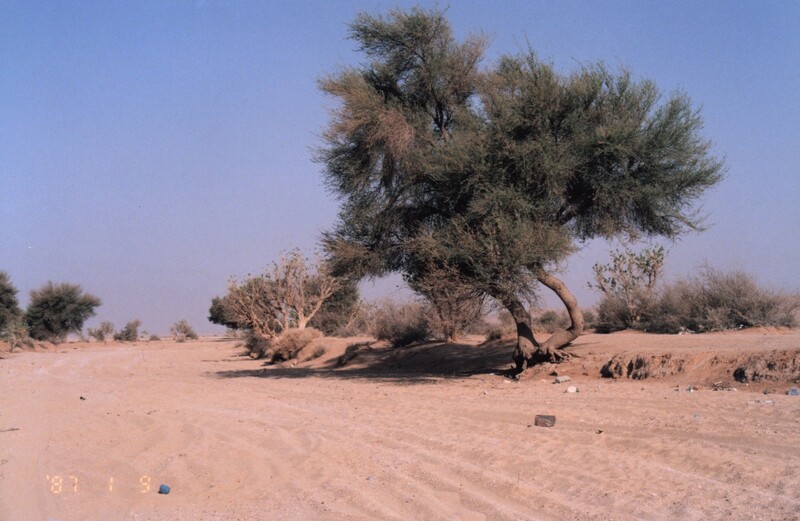 Vegetation of sandy deserts are also very sparse. The common shrubs and shrublets of the sand-dunes of Dahna and Nafud Deserts are Artemisia monosperma, Haloxylon persicum, H. salicornicum, Calligonum comosum. All these shrubs usually seen with perennial herbs and grasses like Scrophularia hypercifolia, S. deserti, Moltkiopsis ciliata, Cyperus conglomeratus, Stipagrostis drarii ,Centropodia fragilis, etc. Vegetation of the northern part of the country is also dominated by annual species. However, perennial components such as salsola spp., Traganum nudatum, Haloxylon salicornicum, Haloxylon persicum, Artemisia spp., Zilla spinosa, etc. are forming large communities in all range lands. In general, the entire area is divided into Nafud, Hammad, Harrah, Widyan, El-Shama and Wadi Sirhan, each of which has a characteristic vegetation. Vegetation of the western part of the country is diverse and dense. These areas are mainly divided into coastal Tihama, foot hills and escarpments. The mountains on the western and northwestern regions are discontinuous. Vegetation on high altitude areas of these mountains is dominated by Juniperus phoenicea, Olea europaea, Acacia etbaica, Commiphora spp., Prunus korschiniskii, Launaea acanthodes, etc. Wadis and foothills are sparsely vegetated. Scattered populations of Acacia tortilis, Maerua crassifolia, Ficus palmata, Moringa peregrina, Ocharadenus baccatus, etc. can be seen in these areas. 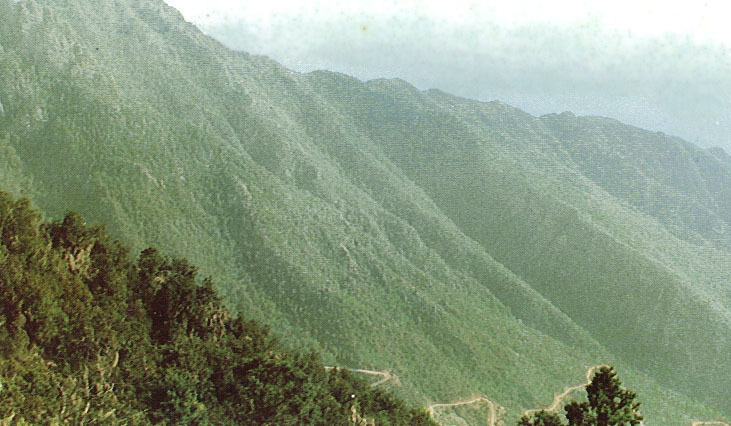 Vegetation of southwestern mountains, particularly the Asir Mountains and surrounding areas, is dense and contained a typical flora of with North East African affinity. Juniperus procera, Olea europaea, Acacia asak, Acacia seyal, Teclea nobilis, Nuxia oppositifolia, Nuxia spp. along with Euryops arabicus, Lavandula dentata, Rumex nervosus, Dodonaea angustifolia, Cluytia myricoides, etc are the dominant plants of high altitude areas. Slopes of the mountains also posses a dense vegetation, mostly dominated by Acacia asak, Maesa lanceolata, Carrisa edulis, Delonix elata, Acacia hamulosa, Cadia purpurea, etc. The ravines and gullies at lower levels are mostly dominated by Ficus cordata ssp. salicifolia, Acacia etbaica, Cadia purpurea, Ziziphus spina-christi and a number succulents such as Caralluma, Sansevieria, Ceropegia, etc. However, the eastern slopes of the entire southern Hijaz are rain-shadow regions. Vegetation on the eastern side of the escarpments is mostly dominated by succulents like Euphorbia and Aloe. Vegetation on the extreme southwest mountains is more or less similar to that of Yemen. 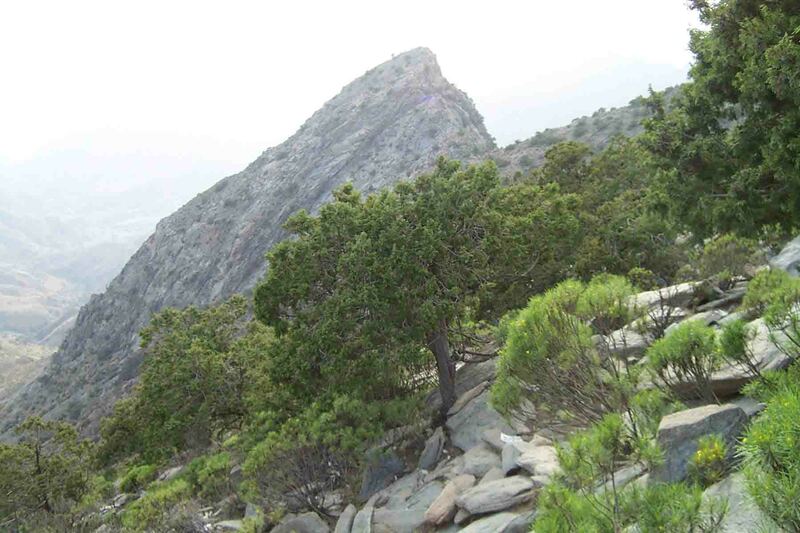 In Jabal Fayfa, the dominant species of the high altitude areas are Juniperus procera, Acacia mellifera, Ficus sycomorus, Euclea schimperi, Dracaena ombet, Acacia seyal, etc. while in low altitudes, the species composition is dominated by Commiphora spp., Trichellia emetica, Delonix elata, Mimusops laurifolia, etc. Low lying areas and other open plains in the Tihama region are with scattered populations. However, in certain areas dense populations of Acacia tortilis, Leptadenia pyrotechnica, Suaeda monoica, Hyphaene thebaica, Salvadora persica, Panicum turgidum, Tamarix nilotica, etc can be seen. Succulent species or halophytes in general are dominating in and around salt pans (Sabkhahs). Species such as Zygophyllum coccineum, Aeluropus lagopoides, Cressa cretica, Limonium axillare, Zygophyllum simplex are common in such areas while Avicennia marina and large colonies of sea grasses are dominating in the shallow waters of Red Sea and Arabian Gulf. Saudi Arabia does not have any rivers or any perennial streams. However, seasonal streams or ponds, mostly seen in the southwestern region contain a few species. 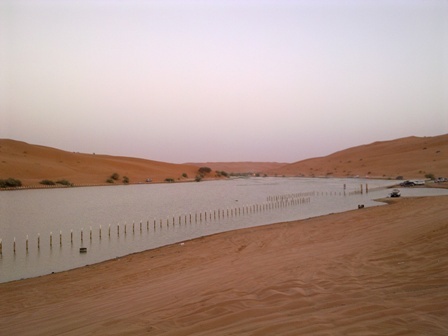 The aquatic flora in Saudi Arabia contains more than 40 aquatic or semi aquatic species, of which Potamogetonaceae has the maximum number of species. Last updated on 26-2-2011. Site conceived and maintained by dr. jacob thomas, dept. of botany and microbiology, king saud university, riyadh.